Mountain Rain Zen Community invites you to join us in Zen meditation practice. Zen practice emphasizes being fully awake to our own moment-to-moment experience, from our meditation cushion to every aspect of our everyday life. Everyone is welcome, whether completely new to meditation or experienced in Zen or another tradition. We welcome and value diversity in our community. 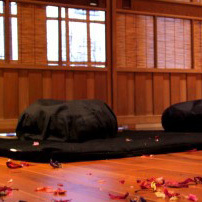 We practice the forms of Soto Zen with a spirit of warmth and inclusion, in the tradition of Shunryu Suzuki Roshi, founder of San Francisco Zen Center. We also draw on teachings and practices from other Buddhist traditions. Our guiding teachers are Myoshin Kate McCandless and Shinmon Michael Newton, and our founding teacher is Zoketsu Norman Fischer of the Everyday Zen Foundation. Everyone welcome to celebrate Earth Day! An Earth Day showing of Chris Jordan’s film Albatross. A monthly meditation group for those in recovery from addiction. Schedule Update: No schedule changes this week.